The Charleston Marriott Business Council is partnering with Food Lion to raise money for the local Children's Hospital. The Renaissance Charleston Hotel Historic District is one of 11 Marriott branded Charleston properties that are a part of the business council and are scheduled to participate and walk in Charleston's leg of this year's Torch Relay in support of the Children's Miracle Network (CMN). Beginning at Brittlebank Park at 2 p.m. on Wednesday, October 22, 2008, the charity walk is sure to be an impactful event that supports local children, and the historic Charleston, South Carolina hotel is proud to participate in this notable event. "We are thrilled to have the chance to impact not only children's lives, but Charleston children's lives by participating in the Torch Relay," explains Dannette Williams, general manager at the Charleston Historic District hotel. "Children's Miracle Network does such wonderful work amongst local communities, and it's a privilege to be a part of such an impactful charity event." The Torch Relay for Children's Miracle Network is a unique and exciting 25 day event that traverses the country each fall via participants walking, running and cycling to raise funds for their local Children's Hospitals. The Torch Relay for Children's Miracle Network, Inc. is a registered not-for-profit organization, and all funds remain to support the Children's Hospitals in the communities where they were raised. For more information or to register, visit http://torch-relay.org. Experience the recent transformation of Marriott's downtown Charleston, SC hotel representing the newest upscale property in the city's oldest Quarter at the Renaissance Charleston Hotel. Whether shopping on King Street, visiting the Spoleto Festival or strolling through the City Market, you'll be captivated by the prestigious ambiance of the contemporary, yet historic Charleston hotel decor that is regionally inspired with a modern twist. 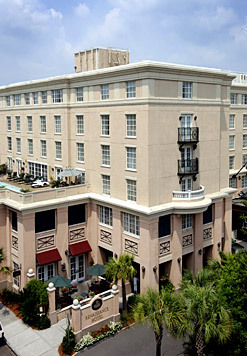 Vibrant themes of iron gates and formal gardens are incorporated into this downtown Charleston, SC hotel, while lavish Charleston accommodations boast new, luxurious bedding and furnishings, as well as enhanced technology including convenient connectivity panels and 32" flat screen HDTVs. Indulge in a Charleston, SC Historic District hotel that combines traditional southern charm with sophistication at the Renaissance Downtown Charleston Hotel and experience a Charleston getaway like no other. For more information or to make a reservation, call 843-534-0300 or visit http://marriott.com/hotels/travel/chsbr.